In this post, we try to use Doctrine to make the models richer, and make it more like a real world application. Imagine there are several models in this application, Album, Artist, Song, Person. An Artist could compose many Albums. An Album could be accomplished by more than one Artist. An Album includes several Songs. An Artist is a generalized Person. In Doctrine ORM, it is easy to describe the relation between models. Album and Artist is a ManyToMany relation. Album and Song is a OneToMany relation. Artist is inherited from Person. The code of Album class. Note, in the __construct method, songs and artists are initialized as ArrayCollection. It is required by Doctrine ORM. Album and Song a bidirectional OneToMany relation. Artist is derived from Person, and inherits all features from Person. All the above codes, the setters and getters are omitted. All the definition are very similar with JPA/Hibernate. Doctrine supports two options of InheritanceType, SINGLE_TABLE and JOINED. Generate the tables via doctrine command line tools. if you are work on the database we used in before posts, use the following command instead. This will synchronize the current schema with models. Try to compare the generated tables when use SINGLE_TABLE and JOINED. The former only generate one table for Artist and Person. The later generate two tables for Artistand Person, the common fields and the discriminator field are included in the person table, when perform a query on Artist, it will join the two tables(artist and person) by primary key, and return the result. 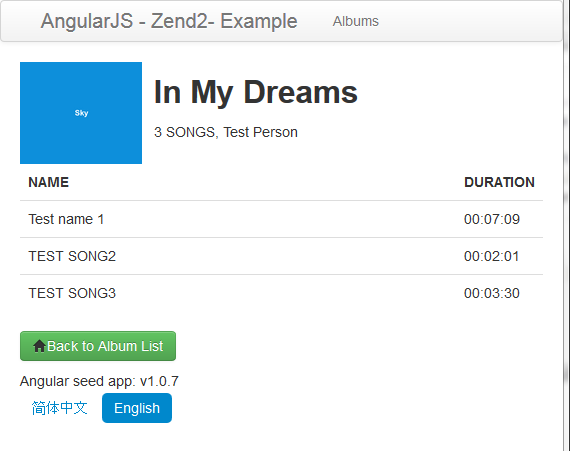 Now, create a details page to display the details of an album. Ideally, a details page could include an cover image(use a dummy image here), album title, count of songs, artists, and the complete Song list. By default, the relations of Artist and Song are LAZY. lazy is a very attractive feature when you access the related property which will be loaded on demand. But in RESTful architecture, the return result is generated by JSON/XML and sent to client. It is impossible access the unloaded relation as expected. Update the get method of AlbumController, we have to fetch the related properties together. Use a Doctrine specific fetch join to get album by id, and the related artists, songs in the same query. Create a new album.html page. Add album routing and album controller. Add some sample data, and run the project on Apache server.